I made the best steaks ever on the grill the other night. I am a novice to grilling. My partner always did that but now that I'm single I am trying learn, as I love my beef. In the past I've always put together a good marinade for steaks on the grill, but adequately so. I was watching the Today show (so much better now that Willie and Carson are on board to balance the fussy, prissy Matt Lauer) and they had a visiting chef, David Guas, who had a recipe for steak rub using coffee. The great thing about the rub is that I had all of the ingredients in my cabinet (that never happens). In the past I always added moisture and seasoning for a marinade (soy or Worcestershire Sauces, Wine, Oil, etc). I had no idea that you don't need moisture. 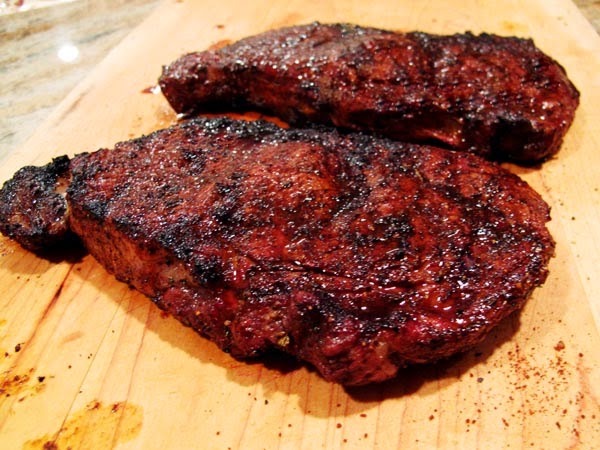 This simple recipe using nothing but a steak rub is magnificent. attempt at the coffee rub recipe recipe below. The results were the best steaks I've ever made (they tasted great because of the rub and did not nut ruin them on the grill). 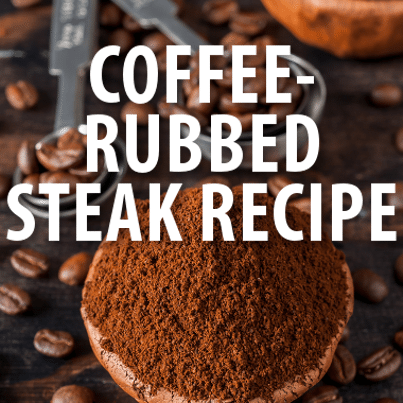 This rub recipe is so delicious and I think the secret ingredient is the coffee. Ina Gartner, the "Barefoot Contessa" always suggests adding ground coffee beans to chocolate recipes to enhance the flavor. This also worked with the steak and the seasons of this recipe's coffee rub. Maybe that's why we all love nice cup of coffee after a great meal? The rub is quick to make. It only takes an hour or so to let the beef "marinade" with the rub. But damned it makes a fine steak. Any type of coffee will work, but grind it fresh before preparing this recipe. Coffee balances the fat of a rib-eye, Guas said. Combine rub ingredients in a bowl before rubbing them on the raw steaks. Chill steaks in the fridge for about 90 minutes to let flavors absorb into the meat. Prepare the grill as you salt and pepper the meat on both sides. Grill over direct heat for six to nine minutes. For medium-rare steaks, reach an internal temperature of 125-130 F. For medium, cook longer for an internal temp of 140-145 F. Cook longer if desired, but move meat off of direct heat and close the grill lid. Let steaks rest on a cutting board for around nine minutes before you slice or serve them. Serve with a dollop of homemade garlic compound butter. The recipe for the steak also calls for a roasted garlic butter. I tried to approximate it by using a dab of unsalted butter and a dash of Lawry's Garlic Seasoning. Cut off the tops of the garlic bulbs and wrap them in foil to create a bowl around them. Drizzle olive oil over the exposed garlic tops and sprinkle them with salt and pepper. Pour water around the edges of the foil before wrapping and sealing the edges. Grill over coals for about an hour. Carefully remove and let rest until cool enough to handle. Squeeze roasted garlic into butter. Mash to combine and season to taste. Roll excess butter into parchment or plastic and freeze in a cylinder for easy slicing and future use. This will last up to three months. I used two good boneless steaks, in lieu of the t-bone! Please try this.......let me know what you think. This rub is outstanding. I can't wait to add the roasted garlic! And a PORTERHOUSE. The recipes and bottom photo are from http://www.recapo.com/today-show/today-show-recipes/today-show-david-guas-coffee-rubbed-rib-eye-recipe-garlic-butter/.